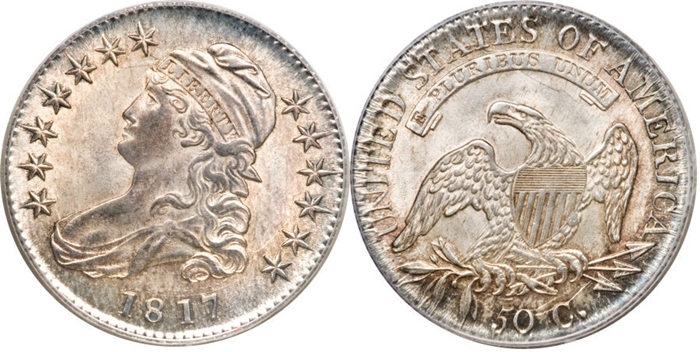 Mint mark: None (all 1810 Half Dollars were struck at Philadelphia). 1807 This date comes with Large and Small Stars on the obverse. One variety has 50 punched over 20 on the reverse. 1808 Look for the slightly rarer 1808/7 overdate. 1809 Check the edge lettering on these - some come with irregular ornaments or I's between the words. 1811 Look for the slightly better "Punctuated Date" that has a defect that looks like a period between the 18 and 11 of the date. 1812 Look for the tougher 1812/1 overdates, Large 8 in the date is most rare. 1813 50 C. punched over UNI on the reverse. 1814 Look for the 1814/3 overdate or the engraving mistake which places the E of STATES over an A. 1815 All examples known of this rare date are 1815/2 overdates. 1817 Two overdates are found in this year - 1817/3 (scarce) and 1817/4 (extremely rare and valuable). Look for the 181.7 "punctuated date" variety. 1818 Several varieties including 1818/7 overdates. 1819 Includes some 1819/8 varieties. 1820 Includes 1820/19 overdates. The 2's in the date come with curved or straight bases - the 2's with straight bases come with or without knobs at the top. 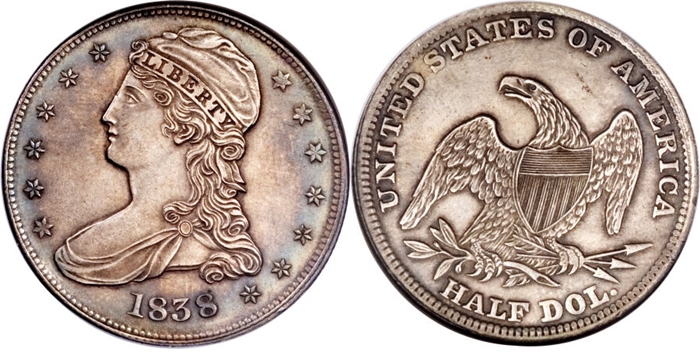 1823 Popular varieties include "Broken 3", "Patched 3", and "Ugly 3". 1824 Many of overdates - 1824/1, 1824/4, and 1824. 1827 Look for the 1827/6 overdate. The 2's of this year are found with curved and square bases. 1828 The 2's of this year are found with curved and square bases. 1829 Look for the 1829/7 overdate. 1830 Found with Large and Small 0's in the date. 1836 Look for the blundered 50/00 reverse die. Late in this year, the reverse was modified by replacing the C of the denomination with CENTS and the edge lettering was replaced with reeding. 1839 The "Small Letters" reverse is extremely rare. 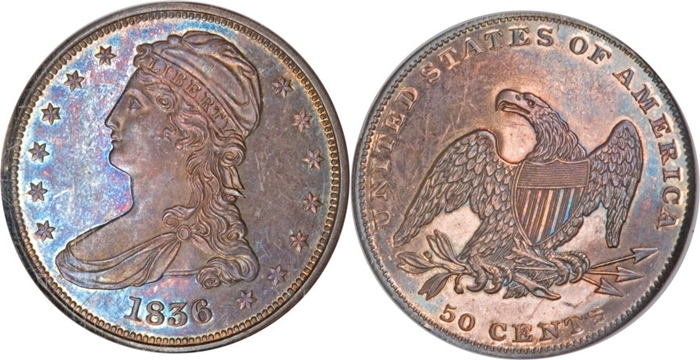 See enlarged images Capped Bust Half Dollar varieties, just click on a date and mint from the price guide.